Selected as Party of the Day on October 10th! 7th birthday Black panther /Wakanda themed party in Calgary Canada on July 18th, 2018. Birthday boy chose the party theme, he loves comics and black panther movies was his favorite marvel movie. 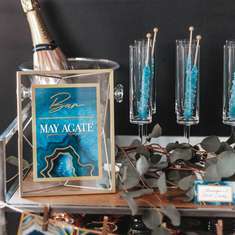 As an event stylist, I started designing the desert table and guest table with Gold, Royal Blue and Black colors. I wanted the table to have a royal feel but also playful, so I made use of toys and some décor items. I incorporated the two main jungle animals in Black panther to the desert table décor – I used a golden panther and a brown rhino which was a good fit for the theme. We made use of toys (black panther mask and hand claws) to design the décor table. 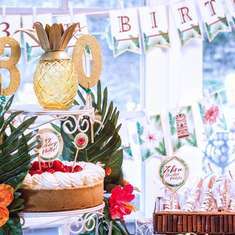 The party was outdoor, and it was going to be a cloudy day, so I eliminated candles and other décor items. 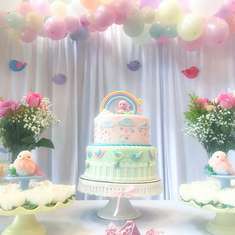 I love decorating outdoor parties, it equals less mess and more fun since there is lot of space to plan games and activities. I used large green Palm leaves to represent the green vegetation of Wakanda country and bring in some Africa vibe. 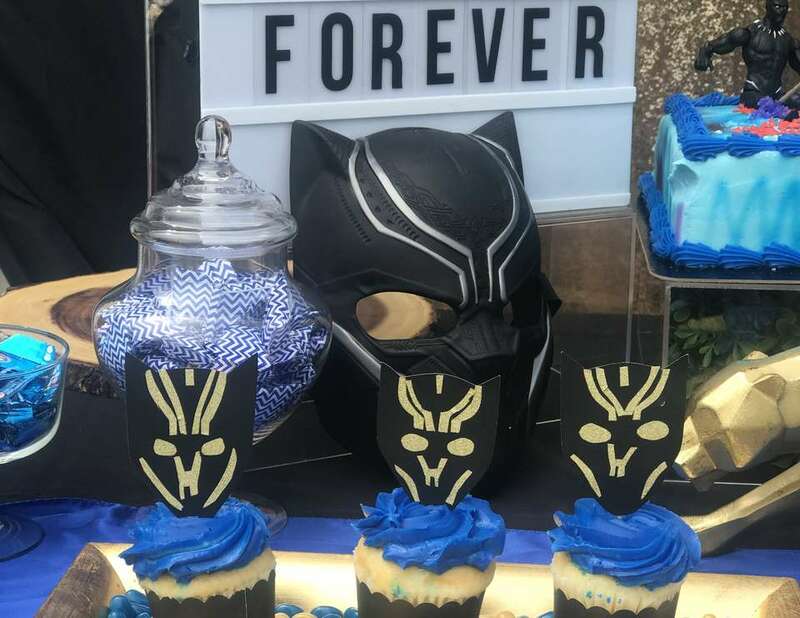 Cupcakes had custom handmade black panther mask as cake toppers with black cupcake holders. 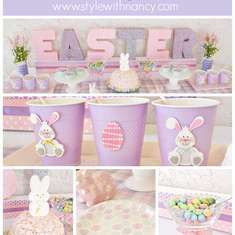 Assorted colors of jelly beans and other candies were placed on the tables for kids to enjoy. A large custom handmade paper cut mask of black panther was placed in the middle of Gold and Black backdrop was used to finish the look of the desert table. Guest table was created using blue chair covers, black table cloth and gold sequin runners. Custom bottle labels and gift bag tags were also made. We used some green plants as centerpieces and light balloon decorations. Kids enjoyed a meal of hotdogs, pizza, caramel popcorn and pretzels and headed out to play games and activities. Games – The kids had lot of fun on the Bouncing Castle, they played Dart board, dodge ball, Mini golf and Piñata. Favors- Custom Party packs with marvel toys and candies.